Reports Q2 (Mar) earnings of $0.68 per share, $0.02 better than the Consensus of $0.66; revenues rose 6.4% year/year to $3.63 bln vs the $3.6 bln Consensus. Now sees annual net revenue growth of 7% to 8% range on a constant dollar basis, with an expectation of about 3% points of negative foreign currency impact (prior guidance was for high single-digit to low double-digit range on a constant dollar basis). Now sees EPS growth of low double-digits on a constant dollar basis, with an expectation of about 4 percentage points of negative foreign currency impact. This now includes interest expense of about $390 million, or over 9 cents of earnings per share, which equates to almost 4 percentage points of reduced year-over-year growth. (Prior guidance was for EPS growth in low-end of the mid-teens range on a constant dollar basis, with an expectation of about four percentage points of negative foreign currency impact). Now sees client incentives as a percentage of gross revenues in high-end of the 17.5% to 18.5% range; and adjusted effective tax rate of about 30%. 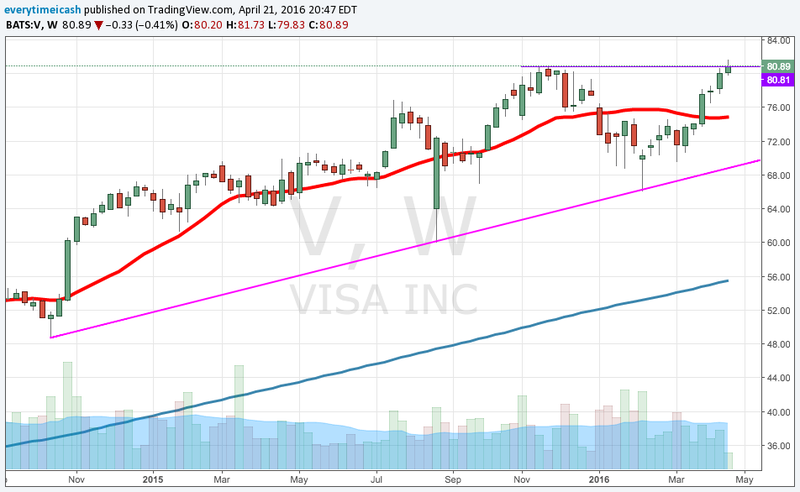 Visa reaffirms its financial outlook for the following metrics for fiscal full-year 2016: Annual operating margin: Mid 60s; and Annual free cash flow of about $7 billion. Back hovering under 78 after reporting, vacillating near last week's low at 77.65. MA is down in sympathy. The co announced that in response to the feedback it received from the European Commission, the company and V Europe reach an agreemen in principle to amend their transaction agreement and eliminate the earn out portion of the costs. The terms of the transaction remain otherwise unchanged. Instead of an earn-out, the cash consideration payable in the transaction will be increased by €1.75 billion: €750 million payable upon closing, and €1.0 billion, plus 4% compound annual interest, payable on the third anniversary of closing.